I have made a TON of allergy free cookies over the past few years. These are my favorite so far. Feel free to play around with the flavor of the jam. We’ve used blackberry, strawberry, raspberry, fig, and apricot. Our favorite flavor??? Raspberry. YUM! These cookies are free of the top eight allergens!! That means there is no dairy, no soy, no egg, no peanut, no tree nut, no fish, no shellfish, and no wheat. 1. Preheat oven to 300 degrees. Grease cookie sheet. 2. Mix egg replacer and water and wisk briskly. 3. Cream together shortening, SunButter®, brown sugar, and egg replacer. 4. Add vanilla, flour and salt mixing well. 5. Squeeze and shape dough into balls and roll in sugar. Place on cookie sheet 2 inches apart. 6. Bake 7 minutes and remove from oven. 7. While cookies are baking stir jam really well and put into sandwich baggie. Clip one small corner of baggie to make a “pastry bag”. 8. Dent each cookie with thumb. Squeeze jam into dent. Bake an additional 15 minutes. 9. Allow to cool 2 minutes and move to a cooling rack. 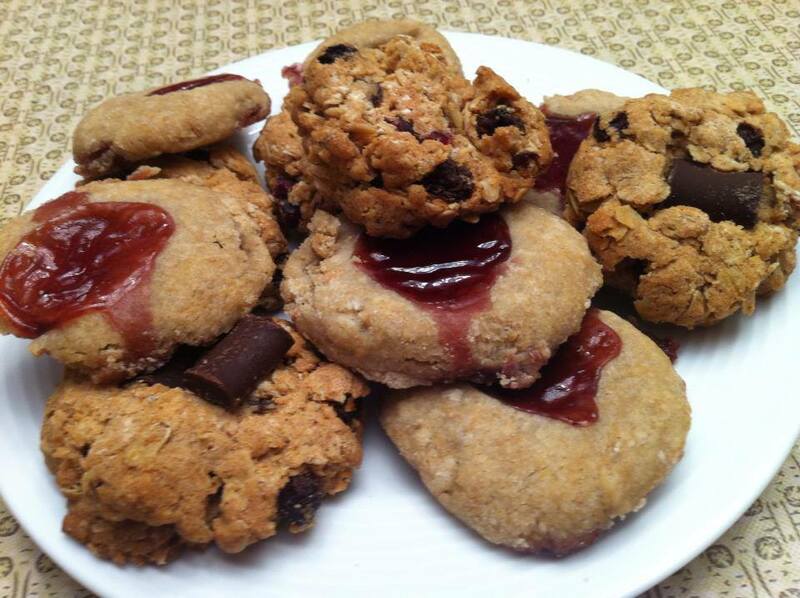 SunButter® Thumbprint Cookies freeze really well too! Follow the recipe as stated, allow to cool completely and put them in a freezer safe bag. I mark ours with the recipe name, date, and allergens (in case our allergen list changes). Just take them out of the freezer and allow them to thaw at room temperature for an easy allergy free dessert. For more great cookie recipes check out a cookie swap that I’m currently enrolled in! 🙂 Enjoy! I foun these on the cookie swap. They look delicious! !